The opening panel on the very first page of this issue is everything that’s right about Ed Benes’ artwork. Strong poses, clean lines, and lots of personality. 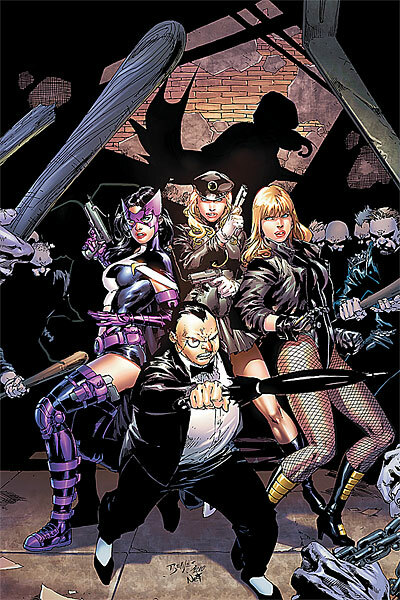 Black Canary and Huntress are staring at a foe who has come out of nowhere and proven to be a real threat to them, but they are more mad about it than scared and they stare down danger with the kind of flippant fatalistic banter we’ve come to expect from Gail Simone. So excellent start to issue 2! Canary is showing signs of having become a harder, angrier fighter since we last saw her. The upheavals that have occurred in other books such as the messy breakup of both her JLA team and her marriage as well as other family traumas seem to have worn down her spirit and she enjoys the brutality of the fight more than she should, leading her to walk right into the trap the fight turns out to be. This issue sets up a clearer picture of the threat to the entire Birds team. 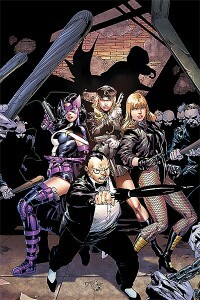 It centers on Canary but fight impacts everyone related to the Birds of Prey including volume 1 supporting cast/erstwhile villains Savant and Creote. I can only hope that the awful glimpse we get of them is not the last. Hawk and Dove play a bit more of a role, showing up with Zinda to rescue the cornered Canary and Huntress, but the retreat is as messy as the fight and made worse by the simultaneous additional moves by the team’s unknown enemy. Forced by circumstances to either retreat with Bat-villain Penguin or surrender to the police, Canary chooses to fight and run. Which is very unlike her and yet consistent with her darker behavior. I have a feeling this arc will be addressing this change in our light-hearted goofball master martial artist as well as cleaning up some loose ends from both volume 1 and whatever the other writers have been doing with these characters during our sad BoP hiatus. This is a middle/beginning story that’s setting up a pretty interesting scenario. I still don’t love Hawk and Dove but they contribute this time out and we get to see a bit of what Canary thinks of Hawk which is helpful. The on-stage villain is scary and peculiar. I have an idea of who she might be, but that theory is a bit obvious and could very well be an implied red herring. We’ll see. The coloring overall looks much better and far less murky. Oracle looks great in a series of expressive and gorgeous closeups, until, weirdly, the final full-length splash page shot of her which is awkward and not terribly flattering. There’s also a bit where she’s shown pulling her hair back and preparing for battle but she pulls back just the back leaving all her hair down around her face. Speaking as someone with hair like that (well, I *just* got it cut today so it’s now much shorter again), that doesn’t help *at all. * The point is to get the hair out of your face and so it really looks like she just randomly changed her hairstyle on her way to battle. I think a lot of comic artists used to showing off impossible superheroic bodies in action have a really hard time making that same body type look awesome sitting down and doing much smaller physical things. So, please work on that, Ed. I’m also getting a little tired of Babs being badly dressed. Too-tight unflattering clothes, weird colors, high-collars. Let’s see some cool workout gear and some action heroine arms shown-off with tank tops. McDaniel used to always have Oracle in action when she was on the line with Nightwing — working out, doing repairs on her systems, grabbing coffee. She was comfy, cutely dressed, and ready for action. Between the bad clothes, weird poses, and ugly glasses, I’ve just about HAD IT with Barbara Gordon, SuperFrump! STOP IT, YOU GUYS! 2 Responses to "Birds of Prey #2 (v. 2)"
Hmm I don’t really like Hawk myself. But hopefully they will turn out well as the story goes along. I only started collecting Birds of Prey. This would be my second issue. I stumbled onto Birds of Prey via your website sometime back and decided to give the team a shot when they began their new run. So far, the comic has been interesting, although I’m not familiar enough with their rogue gallery to know who their unknown enemy is. I’m more of a Marvel fan and it’s only recently that I started collecting Power Girl, Zatanna and BOP. I’d recommend reading the trade for the first arc of Gail’s initial run (“Of Like Minds”). That’s a great story and is strong background for this arc, though Gail does put some context around what’s happening for newbies. I don’t like Hawk either, but I don’t think he’s being presented to us as someone we have to like. Which is good. Thanks for the comment! I’m about the write up #3 — it was fantastic!